The Oil and Water plot, attributed to Ed Mario, has been worked to death over the last four decades. I have studied practically every method and have found several that are excellent. What I offer here is a three phase routine, ending with the all red cards blowoff. The all red cards finish was shown to me by Ray Grismer about five years ago. Me told me that he saw it in Europe during his last vacation there. To begin, remove the 'soft' cards from the pack. The soft cards are the Sixes, Eights and Nines, so called because they can be shown twice and not recognized as easily as the other cards. You will need six 'soft' red cards and three 'soft' black cards. 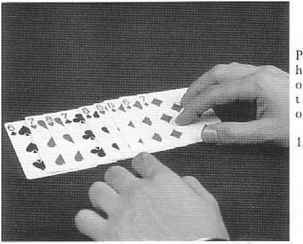 Arrange these cards in a face up packet in your hands, four red cards at the face of the packet and then the fifth and sixth cards are black, the seventh and eighth cards are red and the ninth card is black. 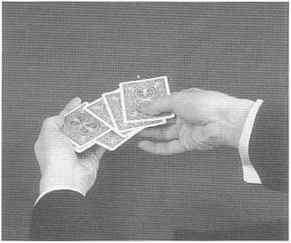 Hold the packet of cards face up in your left hand dealing position. Address your audience at this point by saying, "Remember back in General Science in High School we studied a phenomenon concerning oil and water? They don't mix, do they? 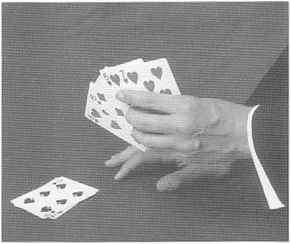 I am going to demonstrate this principle using a few cards. The red cards will represent water." placing the last card on the face of packet as you say, "And the black cards will represent oil." For checking purposes, die face up "black" cards in your hand now consist of three blacks followed by two reds. Now turn the "black" packet face down in your left hand and reach down with your right hand and turn the red packet face down and leave it on the table. Now make a new packet on the table by alternating cards from the red and black packets. Start by taking off the top card of the red packet and placing it by itself on the table and then take off the top card of the black packet, in your hands, and place it on the red card but do not flash this as it is also red. Now take another card from the red packet and place it on the new packet, and then take another card from the black packet in your hands and place it on the new packet, but be careful not to Hash this card as it is also red. Now take anodier card from the red packet and place it on the new packet. 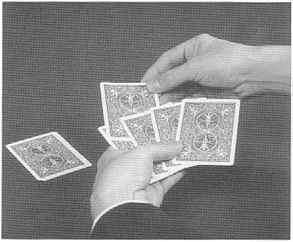 Now lay down two cards as one from the black packet in your hands, a double lift onto the new packet. Now pick up the last card of the red packet and place it on the new packet, and place the last black card in your hand on the new packet. Your "patter" at this point runs along diese lines: "We will attempt to mix oil and water in this fashion. But, as you see, the oil always rises to the top." As you speak this last line, pick up the tabled packet in your hands and spread over the top four cards and take them, as a block, in your right, hand. 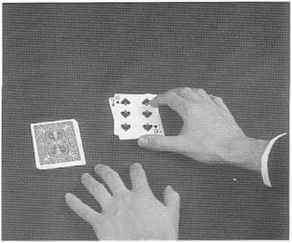 Left hand sets its five card block on the table face down. 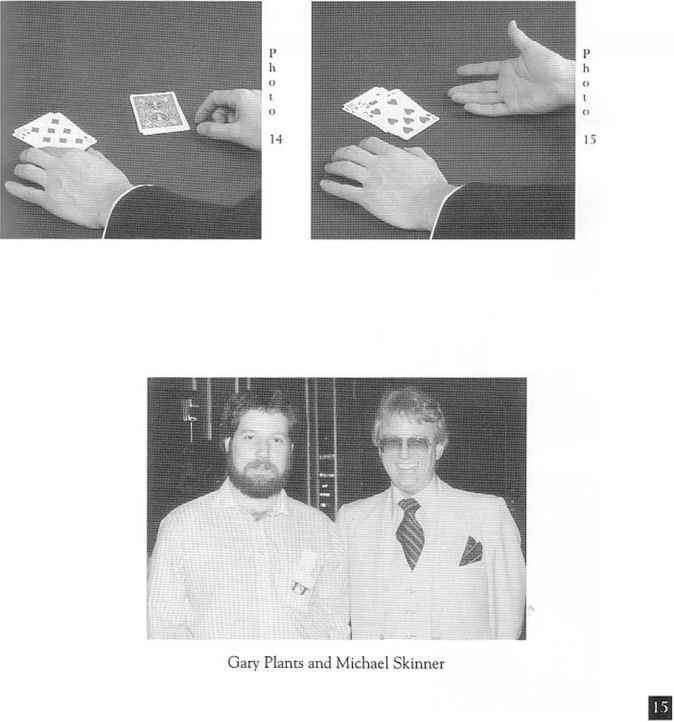 Turn the packet in your hands face up and perform an Elmsley Count to show four black cards. Place the last card on the face of the packet. Set this slightly spread packet face up on the table, so that three black cards will show. This display helps to "ring in" the fact that the packet contains all black cards. Reach over and pick up the face down "red" pile. The packet actually contains five "red" cards but you will display them as four "red" cards. 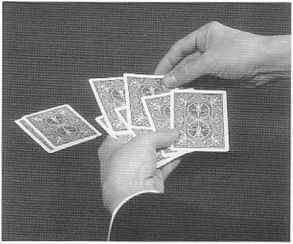 Hold the packet face down in your left hand and spread over the first three cards, holding the last two cards together as one. Display this spread bv tilting up the left hand to show four red cards. (See Photo 2) The bottom two cards are held squared as one. Now pick up the next card off the top of the tabled black packet. You may flash this as it is black. Insert this card between the second and third cards of the red card fan. (See Photo 4) The "oil" cards are inserted for half their length. Pick up the next black card from the tabled packet, flash it and insert it between the first and second cards of the red fan. (See Photo 5) Now pick up the last black card from the table, flash it, and place it on top of the red card fan. (See Photo 6). 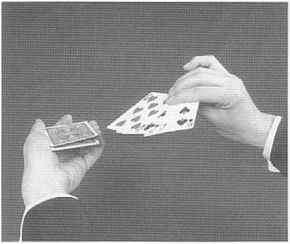 Reach over with the right hand and push the "oil" cards flush and square the packet between your hands. As you say, "We attempt to mix oil and water again-but once again the oil floats to the top. 6 bottom card of the right hand fan. This card is red. 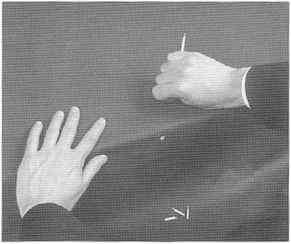 At the same time the right second fingertip reaches tinder the fan to hold the broken black card, i.e., top card of the left hand packet, against the bottom of the fan. 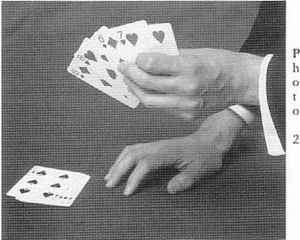 Move the left hand forward, towards the table, with its packet, taking with it the fourth card (red) from the right hand p fan. You are simply exchanging the I, position of the fourth and fifth cards. 0 Reach over and pick up the "water"
Say, "Let's try it one more time." With your right hand reach over and turn the black packet face down. Say, "We will attempt to mix oil and water again!" Pick off the top card of the face down tabled packet. You can flash it as it is black. Insert it between the third and fourth (double card) cards. (See Photo 1 1) Lower the fan to a horizontal position. Pick up the next card from the tabled packet. Do not flash it because it is red. Insert it between the second and third cards of the red card fan. Pick up the next card off the tabled packet.. You may flash it since it is black and insert it between the first and second cards of die fan. Pick up the last tabled black card, flash it and place it on top of the fan. (See Photo 12) Push the outjogged cards flush and square the packet. 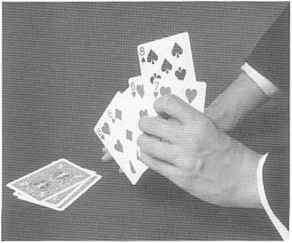 With your left thumb shove over four cards to the right and catch a left finger break under the fourth card. Turn top two ^k, plgBP^^M j.
the first card. 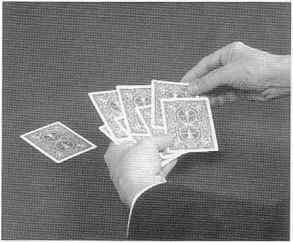 Now shove over two cards as one, which is easy to do because of the break, and take them under the two cards in the right hand. Shove over one more card with the left thumb and take it under the cards in the right hand. Set the remaining cards in the left hand face down on the table. Pause, and say, "Turn about is fair play!" 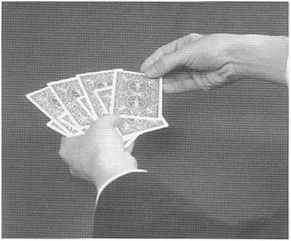 Turn the cards in the right hand face up and Elmsley Count them to show four red cards, or water cards. The last card in the count is placed on the face of the packet. Set the packet face up on the table and spread it a little to show a number of red cards. (See Photo 14) Say, "If these are die four red cards, then these must be?" Pause, and let the spectator answer for you. When he says, " The four black cards!" You say, "No, the other four red cards! Now wouldn't the Persian Gulf like to get rid of the oil like this?" Pick up all the tabled cards and place them face down on top of the pack to finish. 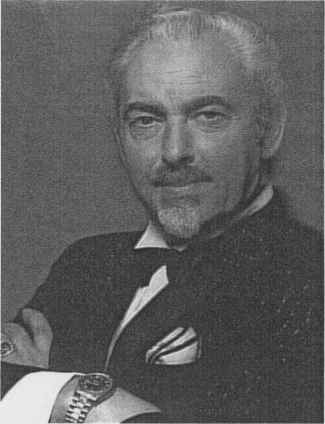 It was many years ago, back in the Sixties, 1 believe, when I discovered James Nuzzo's "Hung Card" in the New Tops magazine. Shortly thereafter I realized that many different objects could be stuck just below the edge of a table top to produce startling results. After showing both hands empty in a natural gesture, make a motion of picking up the three pieces in the right hand, actually sweeping the pieces into your lap and picking up the whole cigarette or match with the right thumb and fingers. Push the whole cigarette or match through your right fist to show it restored. ( See Photo 2) A very startling effect! The proper "shade" here is to ges-p ture with your right hand to show it h empty as you reach with your left hand ° to pick up a salt shaker at the left side of the table. Look towards the salt o shaker as you sweep and steal with the 2 right hand. Sprinkle some salt on the back of your right fist as you mention that salt has great healing and restorative powers. Now push the cigarette or match through your fist to show it restored. While playing with different objects, I attached a pair of green dice below the table edge with a bit of wax. Now I could throw out a pair of red dice and change them to green. In my opinion, the best effect, because of an interesting patter story, is to change dice to sugar cubes. 1 carry three or four pinhead-size balls of wax on the underneath side of my wristwatch band. As soon as I sit down at the table I attach the wax pellets to the edge of the table about 3/4 of an inch from the top edge. Remove a handkerchief from your pocket and spread it over your lap. The two sugar cubes are in your right side pocket and a pair of dice are in your left side pocket. Also, a coin box or packet of cigarette papers is in your right side pocket. Reach into your right side pocket, fingerpalm the sugar etibes, and openly remove the coin box. Drop the two sugar cubes in your lap and place the coin box on the table. Perform your favorite coin box effect. Put the box away and remove the cigarette papers. 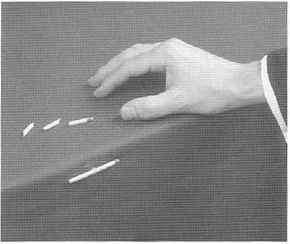 Perform an effect with the cigarette papers (perhaps Nate Leipzig's Torn and Restored Cigarette Paper from the "Stars of Magic"). Now lean back and drop your left hand into your lap. Attach the two sugar cubes to the edge of the table. (See Photo 3) Reach into your left pocket and remove the pair of dice. The dice should be the same size as the sugar cubes. Place the dice near the edge of the table. Sweep the dice off the table into your right hand. Shake them and roll them out onto the table. Do this three times. The third time, sweep the dice into your lap as vou pick up the two sugar cubes and shake them. Roll them out onto the table! This effect is enhanced by the following patter. This is an old joke that 1 borrowed from Gen Grant, but it plays well here: "Some time ago a magician and two other suspicious ooking characters were arrested for shooting dice, and were brought into court. The judge decided to let them convict themselves in a novel manner. He had the first man throw the dice and he threw a seven (or whatever number you nappen to throw when doing the trick). So he gave that man seven months in jail. The next man threw a ten, so he gave him ten months in jail. 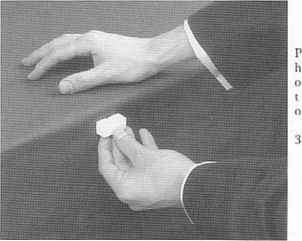 Next it was the magician's :rn, and he started to throw the dice, but caused them to change in midair to lumps r sugar. He gave the judge a big smile and said, "Look, your honor, there are no spots on them!" And the judge smiled back and said: "All right, you go to jail until the spots reappear. Sometimes we have to take our lumps!" Leave the dice in your lap for awhile. Then casually gather up your handkerchief ith the dice in it and place all in your right hip pocket.